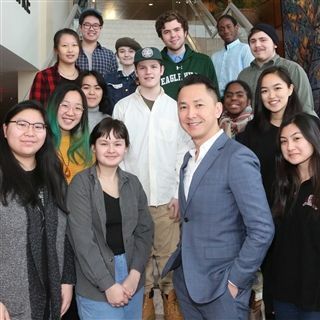 Pulitzer Prize writer, Viet Thanh Nguyen recently visited Eagle Hill School. The writer conducted a fiction writing workshop with selected students from Eagle Hill, and other nearby schools. In the writing workshop, students learned how to employ setting, word choices, and descriptions in their writing. Afterwards, Nguyen read excerpts from his book, "The Refugees" to the school. In his presentation, the writer discussed his own writing process, and the importance of adding diverse voices to the literary canon. Nguyen's lecture enhanced the students' knowledge about the plight of refugees worldwide, and encouraged them to become engaged citizens.